IAI and Effective Space have signed a term sheet for cooperation, including technological and financial partnerships. Under the conditions of the term sheet, Effective Space will appoint IAI as the primary contractor of its SPACE DRONE™ spacecraft, while IAI will work to complete the necessary approvals for equity investment in Effective Space. The term sheet follows more than a year of cooperation, during which both companies have been jointly working on the SPACE DRONE™ spacecraft design. Effective Space is developing a unique, small spacecraft to extend the life of satellites in orbit, based on the vision to provide logistics services in the rapidly growing space economy. To this end, it has developed a unique and patented technology for rendezvous and docking to satellites in space through a small spacecraft called SPACE DRONE™. Effective Space is pioneering a new era in last-mile logistics in space that will see its SPACE DRONE™ spacecraft fleet deployed to provide auxiliary services to space assets. Initial services to be provided by Effective Space will be life-extension for satellites in Geosynchronous Earth Orbit. The company’s first contract, signed in 2017 with an international satellite operator, will see two SPACE DRONE™ spacecraft launched in 2020 to extend the life of two existing satellites, and is expected to generate revenues of more than US$100 million. The design of the SPACE DRONE™ spacecraft is a result of decades of experience in the field of smallsats. ‘Phase One’ services will see the spacecraft dock with existing satellites in GEO that are reaching the end of their normal life expectancy. The SPACE DRONE™ spacecraft will provide station-keeping and attitude-control, relocation, deorbiting, orbit and inclination correction, and is capable of providing up to 15 years of overall life-extension service. Logistics in space is a rapidly developing market and further services will see platform adaptations to support the evolvingLEO and MEO constellations, as well as active-debris-removal and in-space explorations, mining and manufacturing logistics. To meet the expected market opportunity, Effective Space ultimately anticipates a fleet of several dozen SPACE DRONE™ spacecraft to be launched and operated. Effective Space, founded in 2013, has raised US$15 million from investment funds in previous rounds of financing. Nimrod Sheffer, IAI's CEO, said this partnership is an excellent example of the added value in the connection between IAI — Israel's largest aerospace company — with start-ups and the world of innovative technologies and business entrepreneurship. IAI's vast experience and the company's expertise in the development and manufacturing of small, light and fast satellites, and the innovative concept of Effective Space, has the potential for significant business activity. 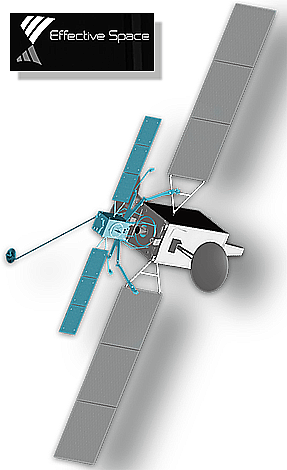 Arie Halsband, the Founder and CEO of Effective Space, added that IAI is globally recognised as a leader in the development and construction of commercial satellite technologies, and in particular, those with high performance and a small form factor. IAI’s intention to directly invest in Effective Space is a strong endorsement of the company's SPACE DRONE program and an indication of the potential return for investors from this new era of logistics in space and in-space robotics. For strategic and growth investors, logistics in space is a new and exciting opportunity.